BBQ Pork Meatball and spring rolls with Rice Vermicelli (Vietnamese thin rice noddles) and Vietnamese sauce. Served with Vietnamese salad- cucumber, lettuce, carrots, and sprouts as well as peanuts. (Peanuts can be requested to put aside). Hot tasty beef stew with carrots, onions, and served with rice or baguette (vietnamese bread or banh mi). Shredded chicken with roasted peanuts. (Banh Mi Ga Jambong). All Baguettes come with home-made Hoisin sauce. BBQ Pork Meat Ball with roasted peanuts. (Banh Mi Nem Nuong). All Baguettes come with home-made Hoisin sauce. Most popular Vietnamese baguette (Vietnamese bread): cold cut meat served with pate (Banh mi thap cam). All Baguettes come with home-made Hoisin sauce. 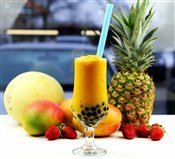 Bubble extra $0.50, Add Jelly $0.50- (mango, strawberry, passion fruit, lychee, pineapple, green apple, rainbow). Double Bubble $1.00, Add Flavour $0.50, Mix 2 Flavour $1.00. Other Flavours: Honey Dew, Cantaloupe, Passion Fruit, Rasberry, Star Fruit, Watermelon, Kiwi, Coconut, Papaya, Red Bean, Sesame, Coffee, Banana, Green Apple, Cherry, Taro, Green Tea, Almond, Cranberry, Blueberry, Guava, Cappuccino, Chocolate, Red Pomegranate. Made with real fruit. 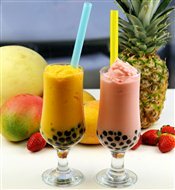 Bubble extra $0.50, Add Jelly $0.50- (mango, strawberry, passion fruit, lychee, pineapple, green apple, rainbow). 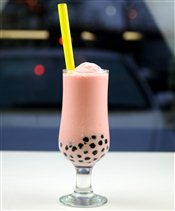 Double Bubble $1.00, Add Flavour $0.50, Mix 2 Flavour $1.00. Other Real Fruit: Pineapple, Mango, Lychee, Jackfruit, Peach, Young Coconut, and Durian. Other choices with different price are: (Soursop $5.50), (Young Coconut & Real Strawberry $5.75), (Young Coconut & Pandan $5.75), (Young Coconut & Red Bean $5.75). Made with real fruit. 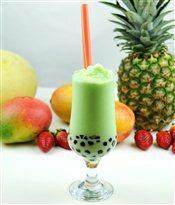 Bubble extra $0.50, Add Jelly $0.50- (mango, strawberry, passion fruit, lychee, pineapple, green apple, rainbow). Double Bubble $1.00, Add Flavour $0.50, Mix 2 Flavour $1.00. Other Real Fruit Choices: Pineapple, Avocado, Lychee, Jackfruit, Peach, Young Coconut, and Durian. Other choices with different price are: (Soursop $5.50), (Young Coconut & Real Strawberry $5.75), (Young Coconut & Pandan $5.75), (Young Coconut & Red Bean $5.75). 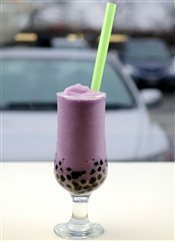 Buy 8 bubble teas and get 1 free! We also sell protein drinks, phytoberry drinks and vegegreens.